Lara Jean’s love life is about to go from imaginary to out of control. I don’t usually watch movies before having read the book, but this one was different. Trying to resist a cozy, fluffy movie-mood is a hard thing to do sometimes and with so many people raving about the movie, I succumbed. Then I ended up desperately wanting the books, bought them eventually and was so, so lucky to pull the first one from my January Jam Jar! To say I was almost jumping up and down – no easy feat when pregnant – is.. well.. spot-on. As with most fluffy contemporaries, I couldn’t stop reading. I was hoping that would happen since I’d been having a rough time concentrating on anything. Truly, that little wiggle didn’t stop moving at times and it had its effects on my reading as well, haha. I read this book in two days? Something like that? I remember sitting in my bathtub for two hours, unable to stop reading. I loved every second of it! I don’t have to be so afraid of good-bye, because good-bye doesn’t have to be forever. Not only the writing helps with that, but also the overall story and characters. 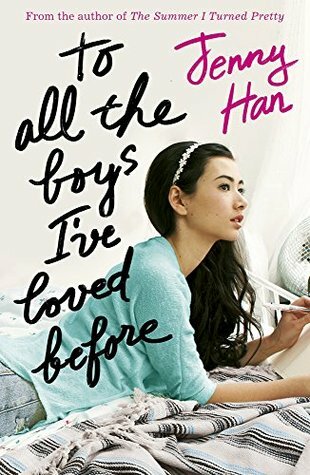 Since I knew most of what was going to happen, I didn’t really anticipate the coming events, but I still found myself pulled into Lara Jean’s story and drama like no tomorrow. It was so.. cute and fluffy and amazing? I don’t even know how to explain it. I guess it’s also a matter of reading the perfect book at the perfect time when in the right mood. Definitely helped. The romance? I can’t even fault anything about it. I kind of like the whole “fake relationship turning into real-ish feelings”-trope and loved it in this book! Although I still can’t figure out whether I’m rooting for Lara Jean and Peter or Lara Jean and Josh. Like.. I don’t know why, but I can’t make up my mind. Maybe the sequels will change that? Hopefully? Or not. I kind of like how I keep changing my mind, not knowing who’d be best for her. We’ll see! Love is scary: it changes; it can go away. That’s the part of the risk. I don’t want to be scared anymore. There’s really nothing bad to say about it. I enjoyed it, loved it and devoured it. Couldn’t ask for more! How can I give anything less than five cupcakes? I can’t! Have you read the book? The sequels? Seen the movie? What did you think? Do you prefer the book or the movie? Are you team Josh or team Peter? What a great review, and I am glad this was a good fluffy contemporary that you could devour! U haven’t read this one mostly because I don’t tend to enjoy contemporaries, but everyone seems to love it! So glad you enjoyed it :] I love this series to pieces. I am a Lara Jean and Peter shipper- I may or may not be in love with Peter K myself…but yes this series is nothing short of fluffy and sweet and just a really great time.